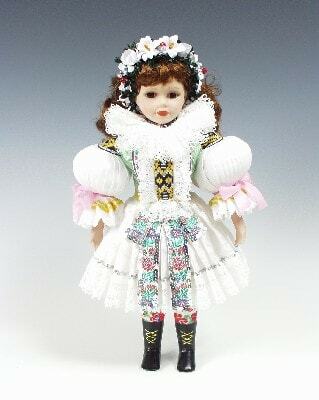 Bride Uhersky brod Czech doll in national costumes for sale. It is the design and style of the clothes match the national folk costumes of the Czech and Slovak Republics. The doll is made of porcelain in box. The doll’s costume is made and embroidered by hand. To make it, we used natural materials and the methods and traditions of folk art. A beautiful and original gift, a designer’s work made by hand!